Advantage® Tactile Systems, is our line of TWSI’s that come in different metal materials. Designed to last the most rigours applications or to enhance the look of your projects while complying with all code requirements. We offer stainless steel TWSI’s that have integral stamped slip resistant micro texture, can be powder coated, available in different sizes and colours, and can be surface applied or cast in place. 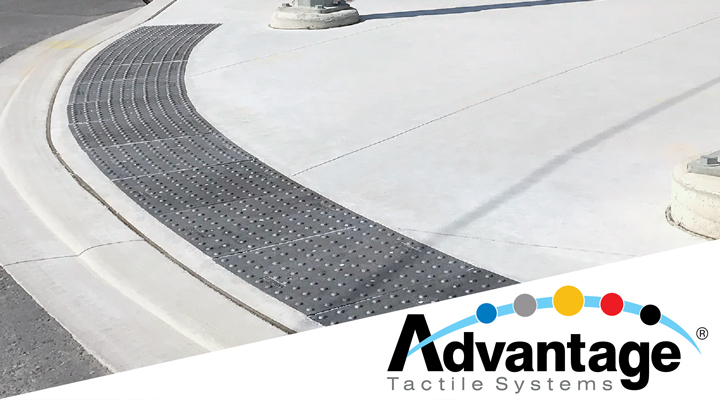 Advantage® Tactile Systems also offers the Advantage® One Domes/Bars or Plates that are either individual domes/bars that are drilled and adhered into the ground or plate format that will be fastened down to the floor. A favourite among the architectural community, these stylish domes/bars or plates are aesthetically pleasing and comply with all code requirements. Engineered to outlast the sidewalk, the Advantage® Cast Iron Plates are a long-lasting TWSI products that are all strong enough to withstand the abuse of heavy equipment such as snow plows, fork lifts and other construction vehicles and are ideal for northern climates and high traffic areas. They are designed to be permanently embedded into concrete and lower your maintenance and product life cycle costs, all while complying with AODA, CSA, ISO, provincial and national building codes. The Advantage® Cast Iron Plate is lightweight with exceptional high strength, and utilizes the most advanced metallurgical Engineering Science and Technology. Advantage® ONE Domes/Bars Tactile indicators are machined from a solid piece of 316L Marine Grade Stainless Steel, and has been designed for all interior accessibility solutions. Advantage® ONE Plate incorporates a solid piece of 316L Marine Grade Stainless Steel Domes/Bars that are fastened to a solid stainless steel plate.